Culinary Academy of India, Hyderabad, India’s first exclusive school of culinary arts, doesn’t sit on its long line up of laurels, but strives to create fresh legacies in the field. Every education institution has a ‘Wall of Fame’—a wall decorated with trophies and medals boasting the achievements of its students. At Culinary Academy of India (CAI), Hyderabad, there are walls, hallways and entire rooms lined with laurels. It is easy to see that India’s first exclusive school of culinary arts is serious about cooking. CAI is located in the heart of the city at Banjara Hills, a stone’s throw away from the top hotels and eateries in town. This is no coincidence. Students are surrounded by the industry they will soon be a part of, where they often explore the kitchens and find placements for internships. There is no grand gate or fanciful board outside the simple, inconspicuous, eight-story building—but there is a culinary legacy brewing inside. For the past 22 years since its inception in 1996, the dynamic CAI has been the gold standard for dedicated culinary education in India. You have to make a chef in a kitchen. Or in eight state-of-the-art kitchens at CAI. “The kitchens are modelled after what students will find in cruise lines and five-star hotels—who are the top recruiters—so they can adopt easily once in the industry,” explains Chef Cyril Clement. Cooking continues all day long in every kitchen. First-year students of the Bachelor of Catering Technology & Culinary Arts (BCT&CA) degree typically tackle international cuisine, working in pairs of three per station. Final-year students get to work on finer culinary aspects like presentation and plating, carving, sculpting and so on. “Creativity is a big part of cooking. You can’t always play with the recipe much, but how to present it, add that ‘wow’ factor is important,” says Chef Cyril, who is an alumnus of CAI, from the batch of 2002, and has been teaching at the institute for the past two years after working in the industry. “The first two years are all about cooking. The final year, the focus is on how to present food. As they say, we eat with our eyes,” adds Chef Akshay Kulkarni, Head of the Department at CAI, who specialises in plating. Besides the BCT & CA degree, CAI offers a PG Diploma and Certificate course, along with a number of short-term courses for cruise lines. Students, faculty and staff at CAI need not worry about bringing packed lunches. While the first-year students can eat the new dishes they cook every day, the responsibility of feeding the rest of the institute falls on the young yet capable shoulders of the second-year students. Every day sees a different menu, and students are continually judged by the faculty based on factors like creativity, taste, presentation and authenticity. First year students take care of serving at the faculty restaurant. This process familiarises students with customer behaviour and gives them a chance to incorporate feedback to improve their learning. “We start with theory, build a strong foundation, and move on to developing the skills. The course keeps getting more practical. The best part of training in the kitchen every day is that there’s no monotony. You practice skills and techniques, but there’s a new dish to make every day,” says Vikrant Sablok, final year student of the BCT & AC programme. In the curriculum, 65% is practical and the rest, theoretical. CAI’s criteria from day one has been to deliver skills and make a student industry-ready. The daily routine is structured in a way that students get an idea of what to expect in a professional kitchen. Students in chefs’ uniforms can be seen bustling around the kitchens all day. This hands-on philosophy is valued by students and the industry. Feedback from recruiters in major hotels constantly highlights the fact that CAI graduates don’t need much training at all—they are ready for the job. CAI has a very good cruise line connection. Since 2003, the institute has placed around 7000 youth in different parts of the world through short-term courses. Many students come in who want to go directly from college to cruise. Top recruiters are Costa Cruises, Italy, Princess Cruises, USA, and P&O Cruises, UK. Considering there’s an opportunity to earn Rs.50-60,000 per month, with no expenditure while on board—it’s a great option for young chefs to kick off their careers. In the galleys of a cruise line, there’s mass production and detailing at the same time—think: 1500 caviar plates! That kind of exposure can really add to a young chef’s experience and expertise. This is also a good opportunity for hopeful entrepreneurs. You can work for a few years, save, and invest in your dreams. Taj, ITC, The Oberoi, The Leela, Park, Hilton, JW Marriott, Le Meridien and more—the list of top recruiters runs synonymous with the list of top hotel chains in the country. Besides hotels, culinary graduates have a broad spectrum of career choices. 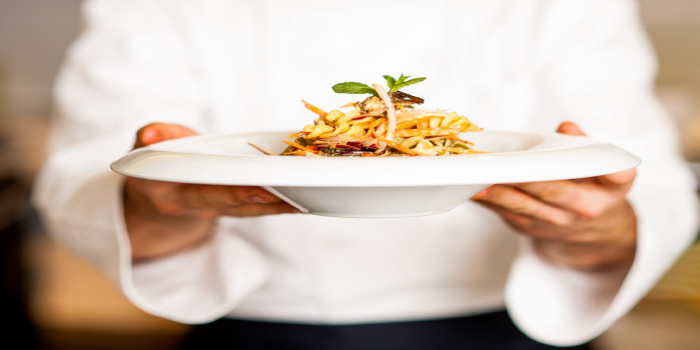 From airline, railway, hospital or institutional catering to working in restaurants or food production organisations, offering services as a culinary consultant or taking up teaching, the scope is endless. “Many students are ready-set-go for the brand placements, and you have those who want to go in for higher education, then there are those who want to try different routes—food photography, food styling, food critique, entrepreneurship,” says Vikranth, the aspiring young chef. Alumni of the institute have reached top positions far and wide not just in India, but across the globe—from Arsenal and Chelsea football clubs to hotels and restaurants in Dubai, Miami, Australia, Kuala Lumpur and Washington to various parts of India. Students get the attention they deserve from the faculty, which consists of 14 Chef instructors, who have worked in the best hotels, restaurants and cruise lines in India and abroad. Out-station candidates are required to stay in a hotel attached to the institute for the first year of the course. Others can seek comfortable accommodation nearby. Students are always taking on exciting challenges. From competitions to food festivals, these young chefs-in-the-making have a culinary calendar full of fun. In fact, students and faculty have joined hands to set a few Guinness World Records—the longest cold meat platter, most number of different cakes displayed, and tallest cupcake tower! Careers360 brings here an exclusive interview with Chef Sudhakar N. Rao, Director, Culinary Academy of India, Hyderabad. Q. What inspired you to start India’s first culinary institute? A. In European and American higher education, hospitality is one stream, culinary is another—there is a clear distinction. Only in India, there is such a thing as ‘hotel management’. I was a hotel management graduate, working in the US. At that time, I realised we have to make this bifurcation in India. So, I wanted to start a school that exclusively trains chefs. Q. What is the state of culinary education in India? What needs to change? A. Culinary education is catching up now, and has a vast future. USA has over 1200 culinary institutions, big and small. That will happen in India very soon. With major higher education career options getting a beating, others are coming up in a big way—culinary is one of them. There needs to be a professional body to monitor culinary education in India. Engineering is in doldrums today, because somewhere, monitoring has failed. In the basket of 10 good institutes, there are 90 which might have met the requirements for building size, area and equipment, but didn’t have the capacity to really handle them or teach its students. Culinary is also a highly skilled career. Monitoring is a must. Q. Your take on emerging trends in food ? A. Indian domestic kitchens are shrinking. People don’t get time to cook. At the same time, they don’t want paneer butter masala every day, so their dependence on regular, hygienic, safe, household food will give rise to the next big business in food—community kitchens. The kiosk business is going to pick up very fast— you’ll have smaller menus or even one-dish kiosks which will operate for just a few hours a day. Third is food on the move. Food has to be designed and properly packed in such a way that people can carry it, without worrying about leaks and spills.